I didn't arrive in Chennai until 2 am local time. I got through Customs very quickly and without incident. When I got to the baggage claim area I had to walk through a metal detector. This seemed odd to me: what kind of metal object could I have with me that was theretofore undetected and now poses a danger to someone. After I picked up my bags I left the airport building. It was like I was a celebrity emerging from a limo onto a street packed with adoring fans. There were so many eager, smiling people gathered around to meet their loved ones and friends. 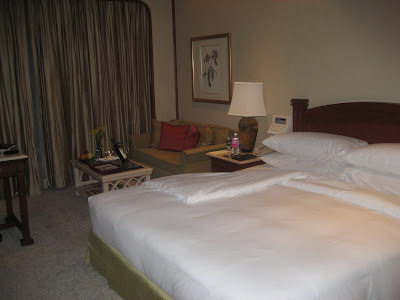 My room at the Taj Coromandel hotel. I was met by a man from the Taj Coromandel, the hotel at which I would be staying. He took me to another man who took me to my driver. A lot of people were involved in the process to get me from the airport to the hotel, and more were involved in getting me checked-in. 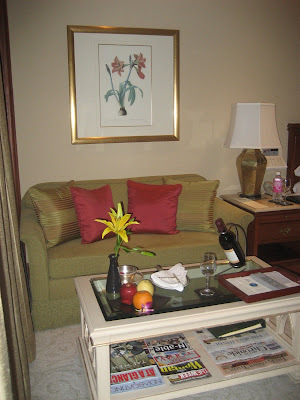 Another view of my room.